Instrumental variables (IV and 2SLS) is a statistical approach commonly used in the empirical social sciences ("instrumental variables" has > 84,000 hits on google scholar) but it often seems to be over-interpreted. I realized this when, as a grad student, I tried to draw a graphical description of what IV was doing. Ever since, I've never bothered to estimate IV and only spend my time on reduced form models. These are my two cents. All of these conceptual innovations were big contributions. But what happened afterwards led to a lot of sloppy thinking. IV is often taught as a method for "removing" endogeneity from an independent variable (variable X) in a regression. While strictly a correct statement (if some relatively strong assumptions are met), it often feels as if it's abused. My perception from papers/talks/discussion is that most students interpret IV in a similar way to how they interpret a band-pass filter: if you find a plausible instrument (variable Z), you can "filter out" the bad (endogenous) part of your independent variable and just retain the good (exogenous) part. While a useful heuristic for teaching, its overuse leads to bad intuition. a = c / b. Enough ranting. How do we visualize this? 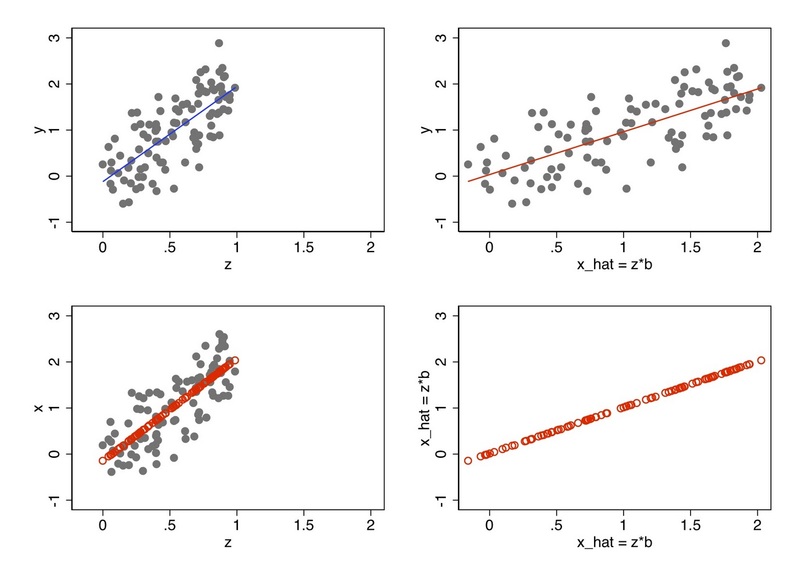 Its as easy as it sounds: you rescale the horizontal axis in your reduced form regression. I then estimate the first stage regression in the lower left panel and show the predicted values X-hat as open red circles. In the lower right panel, I just plot X-hat against X-hat to show that I am reflecting these values from the vertical axis (ordinate) to the horizontal axis (abcissa). 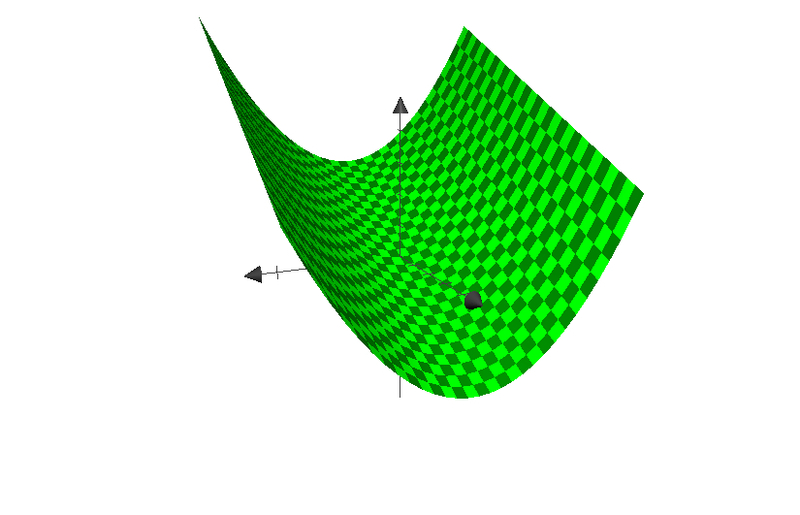 Then, keeping X-hat on the horizontal axis, I plot Y against X-hat in the upper right panel. This is the second stage estimate from IV, which gives us our unbiased estimate of the coefficient a (the slope of the red line). 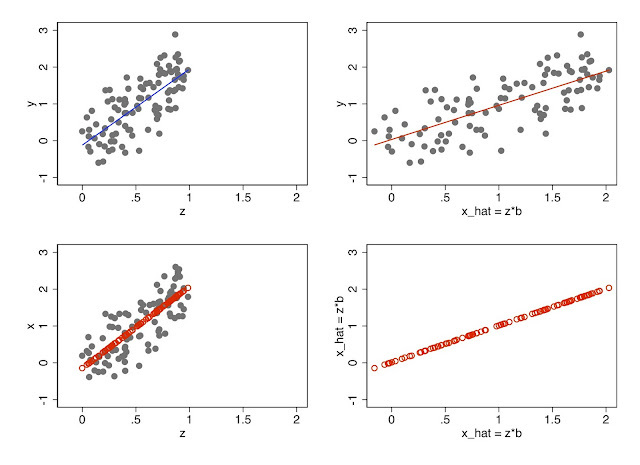 What is different between the scatter on the upper left (blue line, representing the reduced form regression) and the scatter on the upper right (red line, representing the second stage of IV)? Not too much. The vertical axis is the same and the relative locations of the data points are the same. The only change is that the horizontal variable has been rescaled by a factor of two (recall the data generating process above). The IV regression is just a rescaled version of the reduced form. What happened to X? It was left behind in the lower left panel and it never went anywhere else. It only feels like it is somehow present in the upper right panel because we renamed Z*b the glitzier X-hat. Sometimes people have more than one exogenous variable that influences X (eg. temperature and rainfall). Both of these variables can be used as instruments in the first stage. What happens to the intuition above when we do this? Not too much, except things get harder to draw. But the fact that it's harder to draw doesn't mean that the estimate is necessarily more impressive or magical. where the two horizontal axes are Z1 and Z2 and the vertical axis is X. The resulting second stage regression would take the observed value for Y (purple) and project it onto the predicted values for X (green). The parameter of interest (2 here, but the variable "a" earlier) is just the ratio of the height of the purple surface to the height of the green surface. 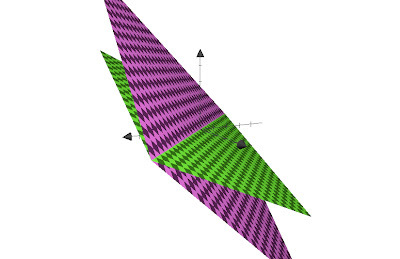 Again, everything can be stated in terms of the instruments Z1 and Z2 (the two horizontal axes), which means the reduced form is again just as good as the second stage. X only enters by determining how steep the green surface is. 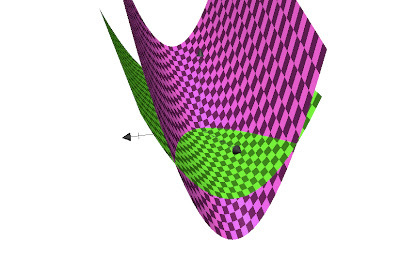 Since the second stage didn't change, the height of the purple surface is still always twice the distance from zero relative to the green surface (a scatter plot of pink vs. green values would be a straight line with slope = 2 = a). 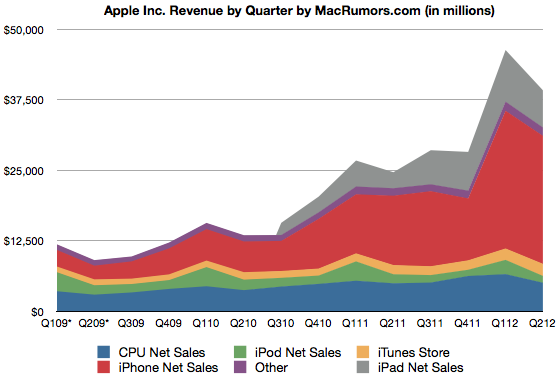 This graph looks fancier, but the instruments Z1 and Z2 are still driving everything. 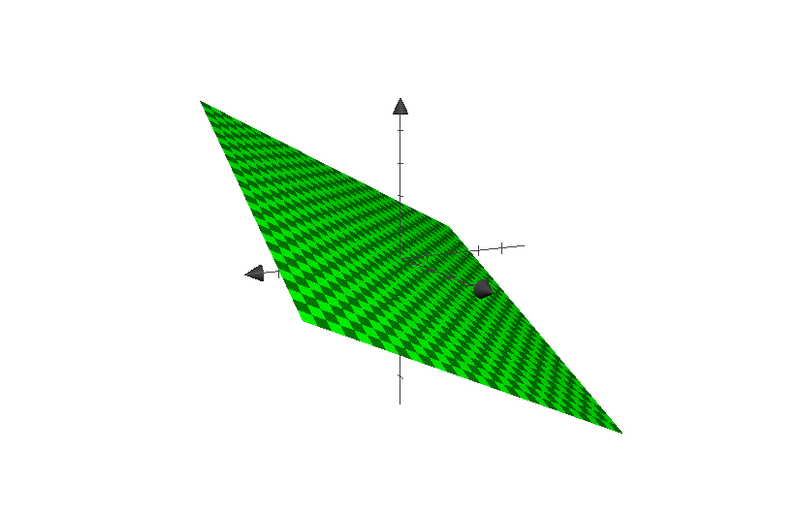 The endogenous variable X only enters passively by determining the height of the green surface. Once that's done, the Z1 and Z2 do the rest. Take away: Reduced form models can be very interesting. However, instrumental variables models are rarely much more interesting. In fact, all the additional interestingness of the IV model arises from the exclusion restriction that is assumed, but this assumption is usually false (recall: how many papers use weather as an instrument? ), so the IV model is probably exactly as interesting as the reduced form, except that it has larger standard errors and the wrong units. The war against the malaria parasite has raged for millennia, and still claims hundreds of thousands of lives each year. Resistance is a growing issue — for both the parasite to current therapy, and the mosquito to pesticides. Past attempts to eradicate malaria have failed. What will it take to finally subdue this deadly disease? The social sciences are flourishing. As of 2005, there were almost half a million professional social scientists from all fields in the world, working both inside and outside academia. According to the World Social Science Report 2010 (ref. 1), the number of social-science students worldwide has swollen by about 11% every year since 2000, up to 22 million in 2006. The main solution, however, is to change the mindset of the social-science community, and what it considers to be its main goal. If I were a student now, I would throw myself at global challenges and social innovations; I hope to encourage today's young researchers to do the same. Abstract: Numerous reports have emphasized the need for major changes in the global food system: agriculture must meet the twin challenge of feeding a growing population, with rising demand for meat and high-calorie diets, while simultaneously minimizing its global environmental impacts1, 2. Organic farming—a system aimed at producing food with minimal harm to ecosystems, animals or humans—is often proposed as a solution3, 4. However, critics argue that organic agriculture may have lower yields and would therefore need more land to produce the same amount of food as conventional farms, resulting in more widespread deforestation and biodiversity loss, and thus undermining the environmental benefits of organic practices5. Here we use a comprehensive meta-analysis to examine the relative yield performance of organic and conventional farming systems globally. Our analysis of available data shows that, overall, organic yields are typically lower than conventional yields. 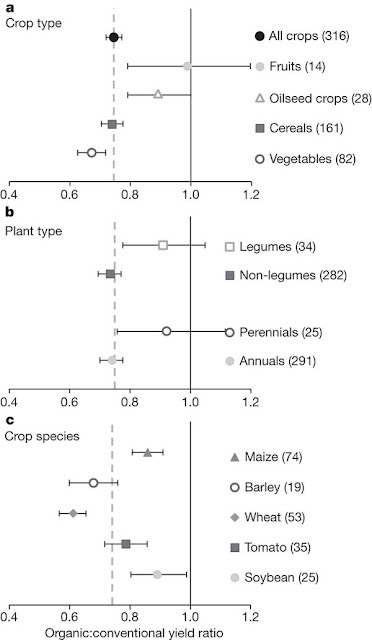 But these yield differences are highly contextual, depending on system and site characteristics, and range from 5% lower organic yields (rain-fed legumes and perennials on weak-acidic to weak-alkaline soils), 13% lower yields (when best organic practices are used), to 34% lower yields (when the conventional and organic systems are most comparable). Under certain conditions—that is, with good management practices, particular crop types and growing conditions—organic systems can thus nearly match conventional yields, whereas under others it at present cannot. To establish organic agriculture as an important tool in sustainable food production, the factors limiting organic yields need to be more fully understood, alongside assessments of the many social, environmental and economic benefits of organic farming systems. Fears of the movement of large numbers of people as a result of changes in the environment were first voiced in the 1980s (ref. 1). Nearly thirty years later the numbers likely to migrate as a result of the impacts of climate change are still, at best, guesswork2. Owing to the high prevalence of rainfed agriculture, many livelihoods in sub-Saharan African drylands are particularly vulnerable to changes in climate. One commonly adopted response strategy used by populations to deal with the resulting livelihood stress is migration. Here, we use an agent-based model developed around the theory of planned behaviour to explore how climate and demographic change, defined by the ENSEMBLES project3 and the United Nations Statistics Division of the Department of Economic and Social Affairs4, combine to influence migration within and from Burkina Faso. The emergent migration patterns modelled support framing the nexus of climate change and migration as a complex adaptive system5. Using this conceptual framework, we show that the extent of climate-change-related migration is likely to be highly nonlinear and the extent of this nonlinearity is dependent on population growth; therefore supporting migration policy interventions based on both demographic and climate change adaptation. Which number from 2011 is bigger: Apple revenue or global insured losses to all weather disasters? I thought, "Wow, that's the same order of magnitude as this:"
Except, when integrated across four quarters, Apple is larger (~$100B) than global insured losses to weather (~$60B). Reading about recent cases in the international criminal court, I realized that I don't actually know much about how the court really functions. So I went looking for a primer on the ICC and found something in the "Global Institutions Series" published by Routledge (and subsequently remembered that I wanted to blog this series a while back). 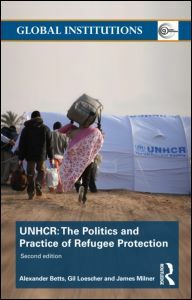 I discovered this series when I went looking for background reading on how the UNHCR functions. I found this book by Loescher et al (pictured), which gave a comprehensive background of the institution in a concise 130 pages (useful for us busy folk). On the inside flap is a list of other volumes that have been assembled, covering institutions from the WHO and the IMF to the International Olympic Committee (see the complete list here). They seem like an imminently practical resource and I've ordered a few more. I may even end up using some in future classes. (FE readers might be interested in the volume on global environmental institutions, which I found in a free online PDF here). The series began in 2005, so some of the volumes might be missing the most recent debates. But for the historical context of these institutions, many of which formed around mid-century (last century), I don't think that should matter much. The "Global Institutions Series" is edited by Thomas G. Weiss (The CUNY Graduate Center, New York, USA) and Rorden Wilkinson (University of Manchester, UK) and designed to provide readers with comprehensive, accessible, and informative guides to the history, structure, and activities of key international organizations as well as books that deal with topics of key importance in contemporary global governance. Every volume stands on its own as a thorough and insightful treatment of a particular topic, but the series as a whole contributes to a coherent and complementary portrait of the phenomenon of global institutions at the dawn of the millennium. Books are written by recognized experts, conform to a similar structure, and cover a range of themes and debates common to the series. These areas of shared concern include the general purpose and rationale for organizations, developments over time, membership, structure, decision-making procedures, and key functions. Moreover, current debates are placed in historical perspective alongside informed analysis and critique. Each book also contains an annotated bibliography and guide to electronic information as well as any annexes appropriate to the subject matter at hand. Abstract: We use a series of field experiments in rural Burundi to examine the impact of exposure to conflict on social, risk, and time preferences. We find that conflict affects behavior: individuals exposed to violence display more altruistic behavior towards their neighbors, are more risk-seeking, and have higher discount rates. Large adverse shocks can thus alter savings and investments decisions, and potentially have long-run consequences—even if the shocks themselves are temporary. A prior version of the paper is available here, repec here. Of note is this great opening line: "Civil wars are sometimes referred to as 'development in reverse'..."
Can some acts of violence be explained by a society’s cultural norms? Scholars have found it hard to empirically disentangle the effects of cultural norms, legal institutions, and poverty in driving violence. We address this problem by exploiting a natural experiment offered by the presence of thousands of international soccer (football) players in the European professional leagues. 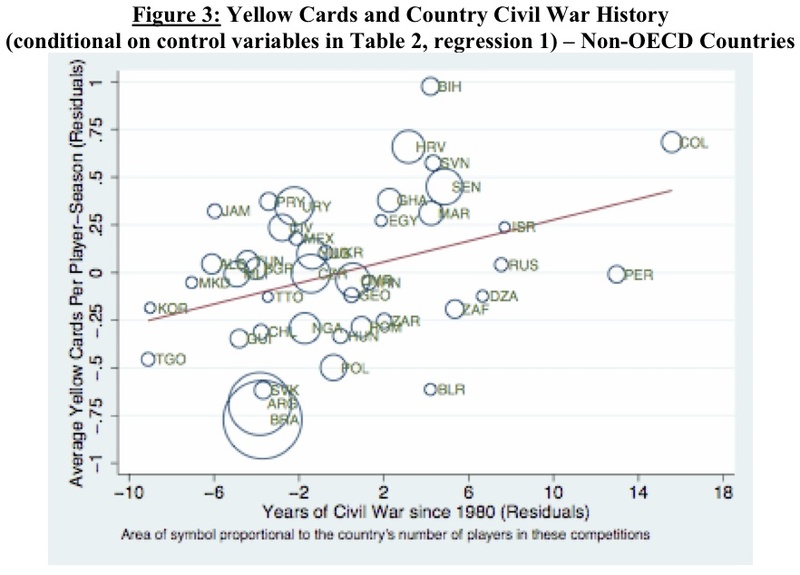 We find a strong relationship between the history of civil conflict in a player’s home country and his propensity to behave violently on the soccer field, as measured by yellow and red cards. This link is robust to region fixed effects, country characteristics (e.g., rule of law, per capita income), player characteristics (e.g., age, field position, quality), outliers, and team fixed effects. 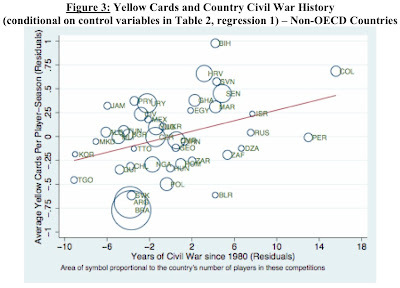 Reinforcing our claim that we isolate cultures of violence rather than simple rule-breaking or something else entirely, there is no meaningful correlation between a player’s home country civil war history and performance measures not closely related to violent conduct. Systematic climate shifts have been linked to multidecadal variability in observed sea surface temperatures in the North Atlantic Ocean. These links are extensive, influencing a range of climate processes such as hurricane activity and African Sahel and Amazonian droughts. The variability is distinct from historical global-mean temperature changes and is commonly attributed to natural ocean oscillations. A number of studies have provided evidence that aerosols can influence long-term changes in sea surface temperatures, but climate models have so far failed to reproduce these interactions and the role of aerosols in decadal variability remains unclear. 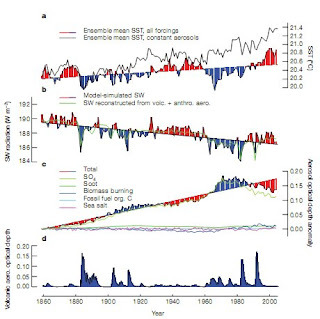 Here we use a state-of-the-art Earth system climate model to show that aerosol emissions and periods of volcanic activity explain 76 per cent of the simulated multidecadal variance in detrended 1860–2005 North Atlantic sea surface temperatures. After 1950, simulated variability is within observational estimates; our estimates for 1910–1940 capture twice the warming of previous generation models but do not explain the entire observed trend. Other processes, such as ocean circulation, may also have contributed to variability in the early twentieth century. Mechanistically, we find that inclusion of aerosol–cloud microphysical effects, which were included in few previous multimodel ensembles, dominates the magnitude (80 per cent) and the spatial pattern of the total surface aerosol forcing in the North Atlantic. Our findings suggest that anthropogenic aerosol emissions influenced a range of societally important historical climate events such as peaks in hurricane activity and Sahel drought. Decadal-scale model predictions of regional Atlantic climate will probably be improved by incorporating aerosol–cloud microphysical interactions and estimates of future concentrations of aerosols, emissions of which are directly addressable by policy actions. A Nature News & Views article on the paper is available here. Abstract: Numerous studies have demonstrated how temperature can affect perceptual, cognitive and psychomotor performance. We extend this research to interpersonal aspects of performance, namely service employees' and salespeople's customer orientation. We combine ergonomics with recent research on social cognition linking physical with interpersonal warmth/coldness. In Experiment 1, a scenario study in the lab, we demonstrate that student participants in rooms with a low temperature showed more customer-oriented behaviour and gave higher customer discounts than participants in rooms with a high temperature – even in zones of thermal comfort. In Experiment 2, we show the existence of alternative possibilities to evoke positive temperature effects on customer orientation in a sample of 126 service and sales employees using a semantic priming procedure. Overall, our results confirm the existence of temperature effects on customer orientation. Furthermore, important implications for services, retail and other settings of interpersonal interactions are discussed. 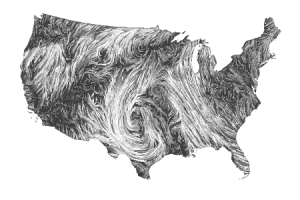 Surface wind data comes from the National Digital Forecast Database. These are near-term forecasts, revised once per hour. So what you're seeing is a living portrait. (See the NDFD site for precise details; our timestamp shows time of download.) And for those of you chasing top wind speed, note that maximum speed may occur over lakes or just offshore. We'd be interested in displaying data for other areas; if you know of a source of detailed live wind data for other regions, or the entire globe, please let us know. Abstract: One of the most basic predictions of human capital theory is that life expectancy should impact human capital investment. Limited exogenous variation in life expectancy makes this difficult to test, especially in the contexts most relevant to the macroeconomic applications. We estimate the relationship between life expectancy and human capital investments using genetic variation in life expectancy driven by Huntington disease (HD), an inherited degenerative neurological disorder with large impacts on mortality. 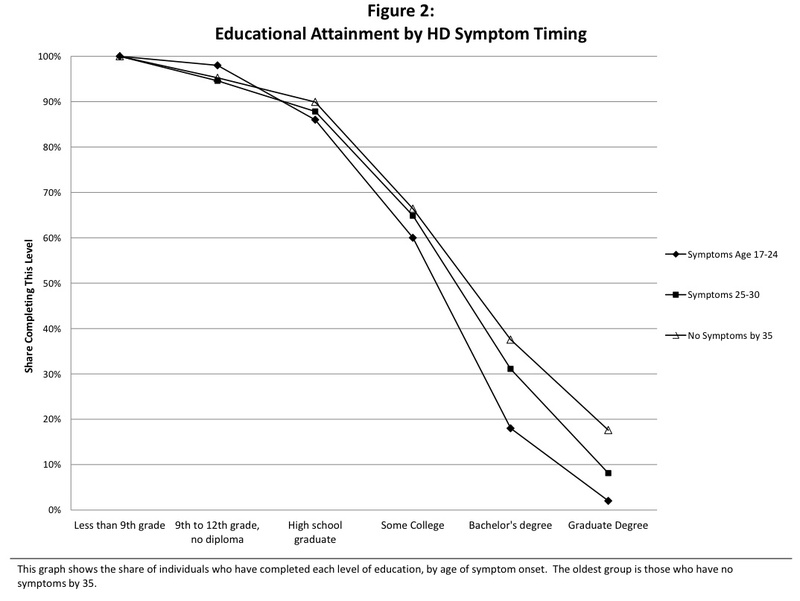 We compare investment levels for individuals who have ex ante identical risks of HD but learn (through early symptom development or genetic testing) that they do or do not carry the genetic mutation which causes the disease. We find strong qualitative support: individuals with more limited life expectancy complete less education and less job training. 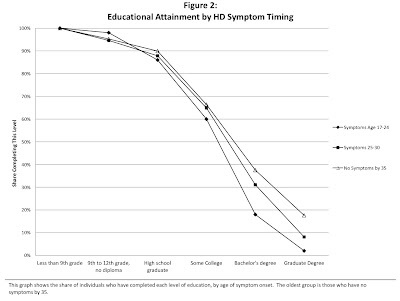 We estimate the elasticity of demand for college completion with respect to years of life expectancy of 0.40. This figure implies that differences in life expectancy explain about 10% of cross-country differences in college enrollment. Finally, we use smoking and cancer screening data to test the corollary that health capital is responsive to life expectancy. fixed cost of opening a basic savings account at a local bank for a random subset of individuals who were initially unbanked. While 63% of people opened an account, only 18% actively used it. Survey evidence suggests that the main reasons people did not begin saving in their bank accounts are that: (1) they do not trust the bank, (2) service is unreliable, and (3) withdrawal fees are prohibitively expensive. In the second part of the experiment, we provided information on local credit options and lowered the eligibility requirements for an initial small loan. Within the following 6 months, only 3% of people initiated the loan application process. Survey evidence suggests that people do not borrow because they do not want to risk losing their collateral. These results suggest that, while simply expanding access to banking services (for instance by lowering account opening fees) will benefit a minority, broader success may be unobtainable unless the quality of services is simultaneously improved. There are also challenges on the demand side, however. More work needs to be done to understand what savings and credit products are best suited for the majority of rural households.